This help section covers all of the "general" topics so that we don't have to repeat them in every single artwork preparation guide. However, reading this is not a substitute for reading the artwork preparation guide for the product that you want to order. Please make sure that you read the artwork preparation guide first. Where necessary, that will link you in to the relevant pages of this help. There are extensive artwork preparation guides for nearly all products. When you are on a product page (a page where you can work out prices) look on the right hand side, near the top. You will see a link to the relevant Artwork Preparation Guide. Click on that to view the artwork preparation guide for that product. If you need help finding the guide or you have any questions at all after reading the guide, just ask the helpdesk. One of the topics that we get asked about most frequently is "bleeds". A bleed is an "extra bit" of artwork that extends past the edge of your design and is usually expressed in millimetres, i.e. "2mm bleed". The bleed area normally contains part of the background images and colour. The example below shows one of our templates overlaid onto a leaflet so that you can see the bleed area (as well as the trim, safe area and crop marks). The bleed area is the bit of artwork between the black trim line (this shows you what you end up with after the item is finished) and the red bleed line. The bottom picture shows the leaflet when it has been finished. Note that the bleed area has been trimmed off. We print on large sheets of paper with multiple sets of artwork "imposed" on each sheet. These then need to be cut up on a large guillotine and may go on for further finishing. Very slight variations in the positioning of your job on a sheet may creep in during the printing and finishing processes. For instance, we might get paper "stretch" on a litho print or paper shrinkage on a digital job. Now imagine a leaflet with a solid green colour all the way to the edge. Without bleeds, your eye would be drawn to a thin white line on one or two edges. Your eye will pick up even fractions of a millimetre! With bleeds you get solid colour all the way around. We recommend that you supply artwork to us with at least 2mm bleed all the way around. More doesn't matter, less does. How do I create bleeds? This depends on which application you are using to create the artwork. If the application "understands" about bleeds, then there will be a write up in the manual or or a section of the help facility. If you are using an application that was not designed to print from, i.e. Microsoft Word, then you will need to "cheat"! A trick that works for most word processors, i.e. OpenOffice Writer and Microsoft Word is to create a page size that equals the desired page size PLUS bleeds. Here's an example of how to do this in OpenOffice Writer. We are going to make the page size 2mm wider all round than the finished size in order to make the bleeds. Set the page size. Go to Format > Page, select the Page tab and then select User as the Format. You can then override the height and width sizes. For example, if I want an A5 (finished size 210x148mm) I input sizes of 21.40cm and 15.20cm. Set the Paper Size. This depends on how you're going to create your PDF. In OpenOffice writer, you would simply use File > Export As PDF... and that will take care of the paper size automatically for you. However, if you are using a PDF writer, then you may need to set the page size explicitly. Here's an example of how to do that in CutePDF. Open up the printer Properties (normally, File > Print.. and then click the Properties button) and then click on the Advanced... button. At the Paper Size: option, select "Postscript Custom Page Size". You may have to scroll down to see this option. You will then be able to input the exact Paper Size that you want, in our example that is 214 and 152mm for A5 plus 2mm bleed all round. If all else fails, then we can usually "make" bleeds for you. You can request this through the helpdesk, or the proofing team may suggest this to you if you're struggling to modify your artwork. There are two ways that we can make bleeds for you. Generally the proofing team will suggest the most appropriate method for you. Method 1 is the simplest, we enlarge your pages make bleeds. This is nice and straightforward, but of course everything ends up a little bigger and closer to the page edges. Of course, you will need to make sure that text and any images that you don't want cut into are well clear of the edges for this to work and it won't work if you have fancy spreads over multiple pages. The second method is a little more complex. We use some clever software that extends objects that are close to the edge and mirrors certain other types of objects. Don't forget to also check our tutorials, we are adding useful step by step guides for specific products here regularly. We've used it, it's very easy and takes seconds to merge your PDF files. A note about Open Source software. The people who develop this are volunteers who do it for the love of writing code and sharing it for free. If you want to support them and help cover their costs, a small donation is usually welcome (but not required). There is a donate link on the PDFsam web site. Update #1: a few customers have reported problems to us with PDFsam. Things like the program asking them to purchase it and placing watermarks on the first page until they do this. Here's what's going on: this is NOT PDFsam! What has happened is that a company called Essex Software, LLC has purchased some paid for google advertising which is being displayed on the the PDFsam web site (www.pdfsam.org) on the left, near the top. This has a big "Download Now " button, which takes you OFF of the PDFsam web site and on to a different web site called "batchpdfmerger.com ". This is NOT PDFsam. To download PDFsam, click on the green "Download " link towards the top left of the www.pdfsam.org page. The advertisers paid-for software may be perfectly fine, but the advert is easy to mistake for the PDFsam download link. In the immortal words of Gomez Adams: "Dirty pool, old man! " Update #2: The nice people at PDFsam say that they will wrap the google adverts with a banner saying "Sponsored links " or similar, so hats off to them for making that clearer. Update #3: People are still getting confused, so we've altered the link so that it lands you directly on the right download page. Update #4: We've been asked if there is a version for Mac. There is, but we haven't tried it. If you look at the download page, you should see a heading: "Other platforms or versions". Under this heading is a link to another download page and the Mac DMG file can be found there. Please also make sure that you read the artwork preparation guide for the product that you are ordering. Why is it necessary to send my artwork as a PDF, why not just send it in the file format of whatever you have created it in? PDFs are the closest thing we have to a "stable " format. That means that what you see on your screen is the same as we see on our screens and is the same as we print for you. That's not the case if you send anything else. What fonts you have installed, how you have your software configured, software versions and so on all conspire together to break your lovely artwork. But what if I don't have Acrobat? Don't worry, most applications now have the built in ablity to create PDFs. If yours doesn't, then there are lots of free ways to create PDFs, just Google it. For example type "best free pdf writer" into the Google search box. If you haven't already started creating your artwork, have a read of the section: WHAT SOFTWARE SHOULD YOU USE TO CREATE YOUR ARTWORK? All of these are good options that have PDF creation built into them. We have a growing number of tutorials that take you through step-by-step in creating your printed item (booklets, brochures, calendars, book covers, etc.) using these free applications. For PDF creation from applications that don't natively support this, we suggested many years that people try cutePDF Writer™, by Acro Software Inc. However in recent times, we've had a small number of reports that the cutePDF download has caused problems. We've researched this and there are some accounts that cutePDF may be installing the Ask Toolbar without the user's express permission. The Ask Toolbar may be very useful, but that's not the point. In our opinion, if you didn't request it, it shouldn't be installed. Anyway, this may or may not be true, but we can't recommend cutePDF until that issue is cleared up. Other than that, at the time of writing, MacAfee (which we use for virus prevention) reports cutePDF to be free of any viruses or malware. If you have ended up with the Ask Toolbar, and you don't want it, just google for "uninstall ask toolbar". Don't worry, there are plenty of others out there, just Google it! When you create your PDF, make sure that you embed your fonts (or convert them to outlines). This means that if you use a font which we don't have installed on our computers here, it will still print properly. We will always check this and tell you if the fonts are not embedded. Tip: many software applications enable this by default. Remember, we will always warn you if your fonts are not embedded. They must be useful right? They're called printers marks because they are used by the printer, i.e. us. Please don't turn them on. Best case, we ignore them. Worst case, they interfere with your artwork and cause problems with your final product. Just the 2mm bleed please (if you need bleeds). Some programs let you choose a Preset, which is a set configuration options, predefined for a specific purpose. If you have this option you should select PDF/X-1a (Commercial Print) if it's available. ALWAYS open the PDF and double check it before you send it to us. Does it look right? Is the page size set right? You wouldn't believe the number of times a simple check before submitting artwork would save time during the proofing process. You don't usually need to know this information. It's here for you to read if you've been told that the number of black & white pages in your PDF artwork does not match your order. This can be confusing for people who are not familiar with getting work commercially printed. When you send us your PDF you may get back a report that indicates the number of black & white pages in your PDF does not match your order. However, when you examine your PDF, you can see that you have correctly ordered the right number of colour and black & white pages. Why are these incompetents at Inky sending you erroneous reports? Yes, believe it or not, our poor old helpdesk and proofing teams do get this reaction quite often. So, to head off any confusion, we've prepared this quick guide. When is Black & White not so black & white? What you look at on your computer monitor may look like B&W, but sometimes it isn't. There are three main reasons for this. (1) Sometimes you've just missed it. It can be hard to spot (and hard to accept sometimes! ), that just one word, or an underline or a tiny graphic in colour is still colour and means that the whole page has to be treated as colour. It's like being pregnant, you can't be a tiny bit pregnant. You either are or you aren't. Sometimes you don't need these bits of colour and we can convert them to black & white for you. However, we can't do this without making sure that's what you want us to do. (2) Black & white pictures, graphics and diagrams CAN BE COLOUR. The easiest case to understand is sepia tinted photographs that you've scanned. Either originally created as tinted photographs, or simply faded with time, these are tints of a colour, not black & white. If we convert them to grayscale (B&W) they will look different. A little more difficult to get your head around are images that LOOK black & white, but aren't. This can be for a number of reasons. For example, B&W photographs are often scanned in as RGB not grayscale (B&W). The reasons for doing this are technical, but the end result is that you may have a scan that looks closer to the original image and it may be possible to manipulate it better in photo editing software. Or you might have just done it by mistake. We can convert these images to grayscale for you, but we need to make sure that's what you want us to do. Incidentally, this is another good reason why you must check your soft proof carefully. Any time we are converting between colour spaces (i.e. RGB to grayscale, or more commonly RGB to CMYK) the colour gamuts are different and we try to make this as apparent as technically possible in our soft proofs. Other examples include diagrams that have been saved as JPEGs. They may look B&W, but often they are not. There are very many other variations on this theme. Don't shoot the messenger. We can't tell you HOW your image ended up as it is, but we can flag it to you and offer to fix the problem for you. (3) Black & white text CAN BE COLOUR. Again, difficult to get your head around. Some of this we fix automatically in the conversion part of the file preparation (proofing) process, some we can't because we might get it wrong. For example: black text in RGB. There is no black "colour" in RGB (Red Green and Blue). RGB is an emitted light model, so black is the absence of light and should be 0/0/0 (no red, no green, no blue). However, some customer artwork ends up with very dark RGB values instead of 0/0/0 for text. Our software will figure out that if text is sufficiently dark it will look black anyway and so we convert it to true black automatically. There needs to be a cut off point to this though. Do you really want very, very dark navy text, or black? We don't know and can't decide for you, so it is flagged as colour. Once again, don't shoot the messenger. Just tell us what you'd like us to do. We try very hard not to overwhelm customers with information that is not useful to them. So, at the "easy" end of the spectrum we will send you a message as part of your report offering to convert to true black & white any pages that you'd like us to convert. You know which pages should be B&W, so just tell us and we'll do that for you free of charge because we're nice like that. Please do follow the instructions, we need the list of pages in a specific format. Once we have your list we'll convert the relevant pages for you and generate a soft proof. If you've read the information above, you'll realise just how important it is to check your soft proof carefully and make sure that the results are what you want to print. This should be fine 99%+ of the time. However, if you do need more information before proceeding (for example if you want to "fix" the colour components yourself), please contact the helpdesk and ask them to send you the full preflight report. We don't send this as standard as it is very technical and full of jargon. The only thing of relevance that it will tell you is WHICH pages are in colour and which are in B&W. All of our printing equipment (lithographic, digital and large format) is computer controlled and calibrated to a pleasing colour balance If you are using correctly calibrated desk top publishing software (i.e. Quark or InDesign) and display hardware, the colours you see on your screen should be a reasonably close representation of the final printed product. Otherwise, you will find that the colour corrected proof that we send you will be closer to the final printed item - although the type and configuration of your display monitor will limit how close this match is. We are sometimes asked whether you can send in a previously printed sample to "match". Unfortunately, we can't do this at these prices. Many times our litho (lithographic) printed jobs will be "batched" (or "ganged" as the American printers call it) with other customer's jobs. Either your job was printed right last time or not Sending us a hardcopy won't help as we can't alter the whole print run, or this would effect everyone else's colours! This sounds like a harmless little fluffy bunny of a topic, doesn't it? If you're not a fully paid up colour management expert, this is in fact the most foul, cruel, and bad-tempered rodent you ever set eyes on. Run away! Design your artwork in RGB and let the nice people at Inky convert it to CMYK for you. Still here? Then you must be an expert. For Litho jobs, Inky uses FOGRA29 for uncoated paper and FOGRA39 for coated paper. For all work printed on a digital press (colour, high-quality black & white) Inky emulates FOGRA39. Wait, what weasel words are these? "Emulates" you say? Yes, FOGRA39 is a data set used for sheet fed lithographic printing using matt and gloss coated paper under ISO12647. At the time of writing this guide, there is still no clear ISO standard for digital printing that we can adhere to. Hence, we emulate FOGRA39 for all paper types. For standard quality black & white (printed on a production black & white machine), we do not recommend colour management. Whatever you do, don't turn colour management on and leave the default profiles in place. You'll most likely end up with U.S. Web Coated (SWOP) v2, which really isn't that close. Yes, we have had about a million jobs sent to us with an embedded profile of U.S. Web Coated (SWOP) v2. If your job is colour critical, always get a hard copy proof. The web site prices are from your print-ready electronic original and do not include any design work, or manipulation of your files. We do offer a graphic design service, including book covers, newsletter and brochure design, folder design and much more. Please contact the helpdesk for a quotation. Please always read the artwork preparation guide for the product that you are going to order. This will give you the detailed information you need and save you time. In general, you should always supply your artwork as a PDF file. We can work with many other formats, but there will be an additional charge and your proof will take longer to generate. Creating a PDF is easy and free! Please also read the "Creating a PDF " section above. Artwork. The electronic files that you upload to us to print. It doesn't matter if it's just text, it's still called Artwork. Online soft proof. The prepared file that you check and approve before we schedule the job to print. Hardcopy proof. A printed copy of your artwork that we mail to you. This is not finished, just the printed sheets and is primarily useful for checking colours and the type of paper you have chosen. Mock up. Sometimes you want a fully finished (i.e. made up into the actual product, for instance a book or brochure) proof to check and show other people. With digital printing you simply order a single copy. With litho printing, you need to speak to the help desk and we will work with you to get the closest approximation possible. Once you have uploaded your artwork to us, there are several stages to proofing. File preparation. We correct many fixable mistakes in your artwork and prepare it for print. This involves converting any RGB colours in your file to CMYK*, so that you have a more accurate view of what the final item will look like. Report creation. If there are mistakes that can't be fixed that are show stoppers, we can't prepare a proof. These are shown as errors in your report. In addition, there may be warnings. These are things that won't stop us printing, but that we think you might want to check. This report will be emailed to you and stored online in your admin area (proofs section) as well). Proof creation. Most people opt for a soft proof, but you can also request a hard copy proof for most products. A soft proof is a specially prepared PDF that you view online. * We don't do an RGB to CMYK conversion for Large Format printing. The reason for this is that Large Format is not printed in CMYK, it uses an extended version of CMYK (CcMmYK). This has a wider colour gamut than CMYK, so we would "lose " colour information if we did a CMYK conversion. By keeping your file in RGB right up to the RIP we give you the most accurate colour possible. For 99% of all orders, you can click away on the proof in your admin area and your browser will load up a PDF viewer that will work well enough. Unfortunately this is a little like saying that 99% of the time you can walk straight across a busy road without looking and it's "absolutely fine", it's the 1% that you have to watch out for. What actually happens when you click on a link for a PDF file within your browser of choice? Hidden within your browser is a set of "file associations", simple instructions that tell the browser what bit of software to use to view each type of file. MOST of the time your browser will use Acrobat Reader to open PDF files. However, in a few cases the browser set is to use a completely different PDF reader! This is a very bad thing. Displaying PDFs is a complex task and best left to the gold standard, which is Acrobat by Adobe. It's for this reason that we recommend that you always download your proof PDF, open Acrobat Reader (it's a free download from Adobe if you don't have it) and then open your proof from Acrobat Reader. It's a very small step that can prevent big problems! The page order of your proof is especially important when you are ordering a booklet or brochure. Please make sure that you read the artwork preparation guide for the product that you are ordering for more details. Q. When do I see a proof? A. A soft proof will normally be processed within 4 working hours. During our busy periods, this may take longer. You will get an email from us once the artwork has been processed that contains your report. If a proof has been generated, you can view and approve or reject your proof through your admin > proofs area of the web site. If you have requested a hard copy proof, you will still get a report and a soft proof, but please do not approve this until you have received and examined your hard copy proof. We will normally send out a hard copy proof within 1 working day via first class post. Q. What if I spot a problem with my proof or need to alter something? A. Just reject your proof. You can then upload new artwork through your admin > uploads area. That applies before you approve your proof. If you spot a problem after you have approved your proof, please contact the helpdesk as quickly as possible so that we can help you sort the problem out. Q. Is there a charge if I need to resubmit my artwork and get another proof? A. For each extra manually processed soft proof we make a small charge. This charge depends on the product, please read the specific help for that product for the exact amount. Extra hard copy proofs are charged at the same rate as the original hard copy proof. You'll need to contact the helpdesk to arrange payment for this, at this time you can't do that through your admin area. Q. Do you check the content or layout of my artwork for me? A. Proofing should not be confused with proof reading. We make a series of technical checks and corrections to make sure that is suitable to print for the product that you have ordered. We don't look at the content, the layout or anything else. Q. How can you possibly manually process a soft proof for such a low price, are you cutting corners? A. We work very hard to make the proofing process as efficient as possible and use an advanced automated workflow. One of the reasons that we have the artwork preparation guides is so that customers supply properly formatted files in a consistent manner. We figure the more work we put into that, the better artwork we get, the more efficiently we can process files. We don't cut corners, every file is run through a series of checks and conversions. AKA the "Safe Area". This is a general "rule of thumb" that is widely used when designing artwork (Desk Top Publishing) and it's a REALLY good habit to get in to. Most of the time when you are designing your artwork, you will have set up a margin all round each page. The Safe Zone is similar in many ways to this and it's basically the area in which you put your text and main graphical elements. A rule of thumb is that the safe area should be around 4-6mm inside the page (trim). It has 2 main purposes. One is to do with style, but the second and most important reason is to do with function. 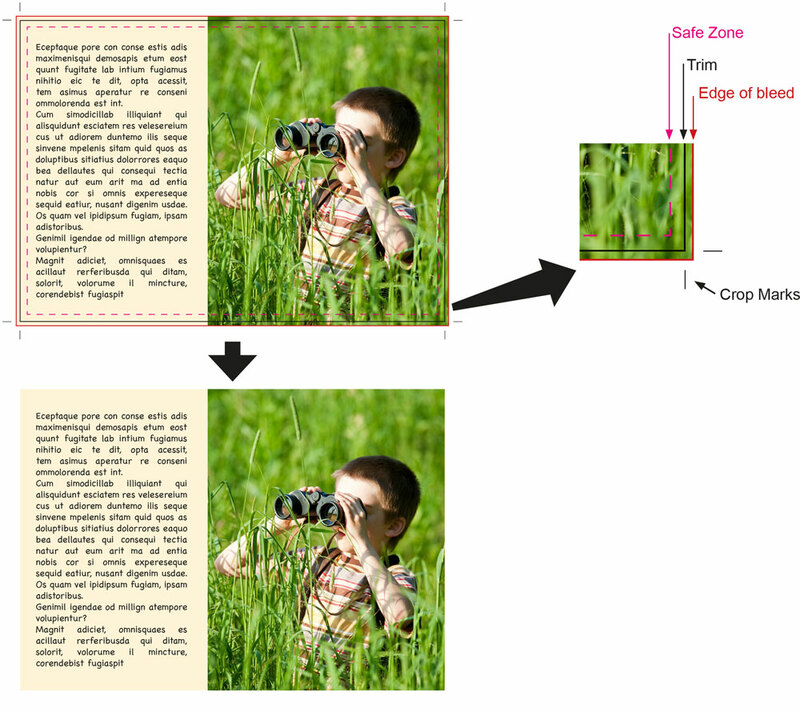 With commercial printing, the tolerance for where the printed content ends up on the physical sheet is not precise down to thousands of a millimeter, rather the "worst case" is plus or minus 1-2mm (approximately). That's why we have bleeds (see previous topic). For example: if you have the start of your text 0.5mm from the edge of the page (trim) and the content is 1mm out, some of your text is going to be chopped off. Take another example: you have a business card (or any other very small printed item) and you have a line of text centered at the bottom, 2mm from the sides and 2mm from the bottom. In this example, take the case where the content is out by 1mm in both directions (this is well within normal tolerances). The net effect is that the text ends up 1mm from the left, 1mm from the bottom and 3mm from the right. What experienced designers know is that the eye is immediately drawn to this level of imprecision. However, if the designer observes a "Safe Zone" of 5mm, the text would end up 4mm from the left, 6mm from the right and 4mm from the bottom and this looks much better. If you have designed your artwork with bleeds (see the previous topic), then it's perfectly normal (and in fact necessary) to have your background colour or images outside of the safe zone. We sometimes don't show a Safe Zone in our templates as it can over complicate them, but it's well worth remembering and following this simple rule of thumb. You can see an example of a Safe Zone in the picture shown for the BLEEDS section above. Before you can send us your artwork, you need to register on the web site and place an order. Registration is pretty straightforward and there is a tutorial to help you (HELP > TUTORIALS). You normally upload your artwork as part of the order process using the standard Inky Uploader. If you miss this step for any reason, or you need to upload new artwork, log on to the web site and go to ADMIN > UPLOADS and use the uploader there. Please do not email us artwork. There's also a "getting started " link on every product page (look for the blue question mark button on the right hand side page). If you have any problems uploading artwork, please call the helpdesk as we can usually help you sort this out, or offer alternative ways to send artwork to us. Please do not send your artwork on a disk, via email or through any kind of internet file transfer without discussing and agreeing this with the helpdesk first. Once you have uploaded artwork, we will prepare a proof for you (see the proof section on this page for more details). If you need help placing an order, please read the help section Help > Placing an order > How do I place my order? We do not keep your artwork indefinitely! If we create artwork for you using our Graphic Design service then we will store it for a minimum of 12 months (this storage does not apply with our low cost Cover Layout service). We keep artwork on a RAID server array with local real time backup to another local RAID server array. Your files are then backed up to another RAID server array at remote location (offsite backup). Although we take good care of the artwork we create for you, we cannot absolutely guarantee its' safe storage. For this reason, Inky will always give you a copy of your artwork on request. If you pay for it, it's yours and we recommend that you store it safely. If you upload your own artwork for a job then we do not guarantee to store your artwork at all once a job has been printed. If you request a reprint of a previous job, we will use previously submitted artwork if this is still available, otherwise you will have to send us the artwork again. To give you some guidance, we will generally keep your print ready artwork (the final file that we print from) for at least 12 months before it's deleted. Some products have an automatic "re-order" button (you can find this in admin > orders). If we no longer have your artwork stored (or re-order is not available yet for that product), then you will see "Re-order not possible" instead of the button. RGB (Red, Green, Blue) are the basic components of the colours emitted by your monitor. All the colours that you can see on your monitor are made up from RGB in different proportions. CMYK (Cyan, Magenta, Yellow and blacK) are the ink pigments used to reflect light back to you from the printed sheet. The full colour images that you see on the printed sheet are actually made up from complex patterns of CMYK. RGB colours must be converted to CMYK so that they can be printed. This conversion is usually hidden from you when you are using a desk top printer. Because RGB has a wider gamut (range of possible colours) compared to CMYK, not all RGB colours can be printed accurately in CMYK. For this reason, professional designers will usually design their artwork in CMYK and preview it on screen in simulated CMYK. You may already have your favourite application, in which case you should probably stick with it if it does everything you want. Professionals will use a Desk Top Publishing (DTP) application. 99% of the time that means Adobe InDesign and that's what we use here at Inky. For simple things that don't require a precise layout, you can generally use a Word Processor. Microsoft Word is the most famous of these, but if you don't have a recent version you should take a look at some of the free Open Source applications. OpenOffice Writer (part of the OpenOffice Suite) and LibreOffice Writer (part of the LibreOffice Suite) are some of the best known of these and of course they allow you to save your artwork as a PDF as standard. In general, people also use a word processor to lay out the book block (all of the inner pages) of their book. It is possible to use a word processor to create the cover as well (and we have a video tutorial showing you how), but given the choice, a DTP application allows you to set out your cover with more precision. InDesign is extremely good, but also expensive. There is a very good, Open Source DTP application available called Scribus and as it's Open Source, you can use it absolutely free (although a small donation is always welcome). Scribus has nowhere near the level of features that you get with InDesign, but it is a perfectly competent and usable DTP application. Did I mention is is free? There is more of a learning curve with using Scribus compared with a Word Processor, but if you want precisely laid out newsletters, brochures, covers and so on, it's well worth investing the time. Pages is a template based application for creating simple items. It is not capable of working with bleeds and during our testing we couldn't find any way of creating a custom page size. This means that it will not be possible to create a document with bleeds (see the help section on bleeds for an explanation of what this means). It should be fine for simple documents that have a clear white border all around each page. We have experienced some problems with PDFs created by Publisher that cause processing delays and in rare cases mean that we cannot process your PDF. Which Applications Should I Avoid? In general, spreadsheet applications (for example Microsoft Excel and OpenOffice Spreadsheet) and Presentation applications (for example Apple Keynote and Microsoft PowerPoint) are not suitable for creating print-ready artwork.